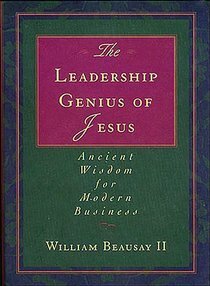 In Leadership Genius of Jesus, Beausay skillfully shows how Jesus demonstrated fifty-nine leadership traits that can be replicated by today's leaders. As readers gain insight into Jesus' strong and unwavering, yet gentle and encouraging leadership style they will learn how to be a leader. A voyage through the business section of your local bookstore can be daunting. You could drown in the sea of books on management and leadership. At the very least the conflicting waves of instruction and advice from one book to the next will toss you back and forth, leaving you confused and disoriented. Which business guru can steer you to the shores of your promised land? Which leadership trend is in, and which ones are out? If an approach works with one person, does that mean it will work with another? Don't let the competing voices make things more complicated than they should be. And don't miss the most powerful example of leadership in history: Jesus. His approach was simple, effective, and brilliant. "How much more information do you need?" asks William Beausay II. "The fact is, very little. What you need are passion and heart. Courage and dreams." You'll find those traits in Jesus' life. The Leadership Genius of Jesus is the lifeboat that will keep you afloat and point the way to fulfilling and dynamic leadership that will impact you and everyone you serve. About "The Leadership Genius of Jesus"
William Beausay is a clinical psychotherapist and author of the best-selling Boys! : Shaping Ordinary Boys into Extraordinary Men Kathryn Beausay is a speech and language pathologist. The Beausays live in Maumee, Ohio with their three children.